I’m not certain if the wall clock has gone the way of the dinosaur as yet. I mean, most of us carry a clock around on a cellular phone anyway, or just look at the clock on the computer. Or if you are old-school, just look at your watch. I don’t think the wall clock will ever go out of style. Just think about all the times where we have passed by the clock on the wall and just said “oh, is that really the time”? Not only that, there is something aesthetically nice about the wall clock. Here is a fancy twist on the wall clock which mixes hi-tech with a time before tech. As you can see, there is a sundial look to this guy, but replaces the natural source of power of the sun with a laser. 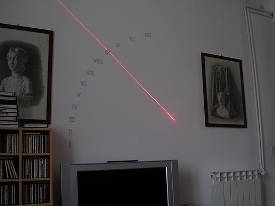 This laser is mounted on a remote control servo driven by a micro controller that keeps the time. This particular XXI Century sundial is only a concept for now, but I think it is good enough to be marketed now for any wall, in any home. I have no idea how much this would go for, but it had better come with detailed instructions for its installation. After all, if you are going to put Roman Numerals on your wall, they had better be properly mounted.